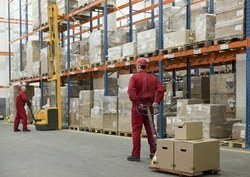 We possess a spacious warehousing unit that is located at a centralized location of the city. Our warehouse is well structured to store the huge amount of daily consignments. Besides, we have ensured to install it with the appropriate storage racks and furniture so as to store our assortment in an organized manner. This helps in the easy access and retrieval of the products when required. The manufactured products as well as the procured raw material are efficiently stored in our warehouse wherein we have ensured safety measures. Our packaging personnel ensure that these goods are packaged using premium quality packaging material. The consignments are thoroughly inspected and then safely dispatched to the clients in a given time frame. The state-of-art infrastructure set up by us spans across a huge area. Considering it to be an essential part of the organization, we have taken utmost care to install it with sophisticated machines and technology. Making the appropriate use of the installed machinery, our talented professionals, efficiently bring forth a qualitative gamut for our clients. Besides, we regularly improvise these equipment so as to keep up with the changing trends of the market. This further helps in enhancing the production capacity as well as the quality of products. All these factors make our collection suitable choice for the dynamic clients.